Verticals and horizontals became rectangles. They still appeared as detached forms against a background; their colour was still impure, but the images of churches, trees or sea views ceased to be used within his pictures. They would now be a new representation of a new kind of future heaven. His Composition of 1916 partly realised this notion, but the black lines still maintained some link to the world. So it was in 1918 that Mondrian poured all his efforts into creating paintings that had a static stability that was also the distinguishing feature of the architecture. At around the same time, Theo van Doesburg had created a new stained glass window design that used diagonal lines to give shape to the whole window. 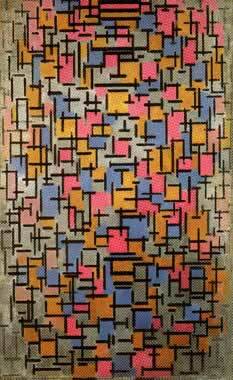 Mondrian became fascinated with the design, and used the motif for some of his new paintings. These paintings were the Lozenge series the first of which was Lozenge with Grey Lines painted in 1918. It is simply filled with black lines covering the entire shape, but they are arranged in an extremely regimented, regular square pattern. The painting is actually two grids, one running parallel to the sides of the lozenge, the other, superimposed follows the vertical and horizontals of the room that the painting will be displayed in. This painting truly reflects the idea of architecture in art and appears like some form of plan from an architect’s drawing board. This painting represents the furthest point of abstraction that Mondrian entered, and caused a great deal of distress to those people he had managed to win over. It was like nothing they had ever seen before, in-fact before this painting, there had never been anything like it!